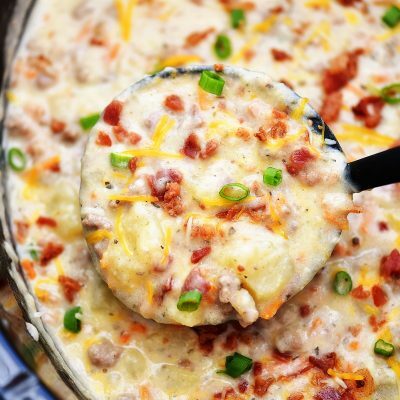 Slow Cooker Bacon Cheeseburger Soup is loaded with potatoes, ground beef, cheese and of course bacon! 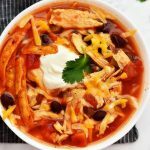 This amazing soup is full of flavor and every soup lovers dream! 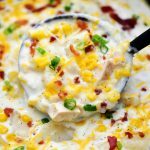 If you remember my Slow Cooker Cheeseburger Soup then you are going to LOVE this Bacon Cheeseburger Soup recipe! Not only did I add crispy bacon to it, but I also replaced the cheddar cheese with pepper-jack cheese and topped it off with green onion. It didn’t make it spicy, but it made it extra delicious! The temps have dropped where I live so it has been COLD! We may even see some snow here which is rare. When it’s this cold all I want to do is curl up on my couch with a blanket, and have a warm bowl of bacon cheeseburger soup! 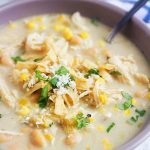 This soup is so comforting and filling. I received quite a bit of questions and comments on my Crock Pot Cheeseburger Soup recipe, so I thought I would include the answers to be helpful in case you might need them. 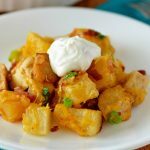 Can I use frozen hash browns or rice instead of potatoes? The answer is YES to both. You can use a one pound bag of frozen diced hash browns. I suggest adding the frozen hash browns when you would add the regular potatoes at the beginning. You can use 2 to 3 cups cooked rice to replace the potatoes. I add in cooked rice at the time I add in the cooked ground beef. 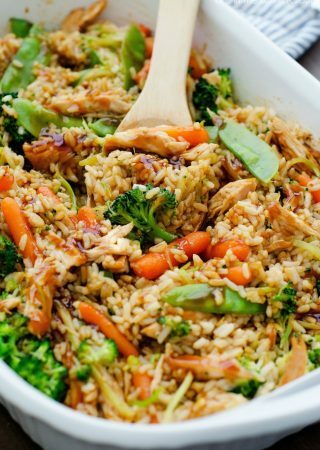 I have tried this recipe once with the rice and it was delicious! Am I able to make this on the stovetop? Yes, you can definitely make this wonderful Bacon Cheeseburger Soup on the stovetop. Using a large pot, add potatoes, onion, carrots, basil, parsley and chicken broth. Bring to a boil, then simmer together until potatoes are tender. Then you can resume the recipe as written. 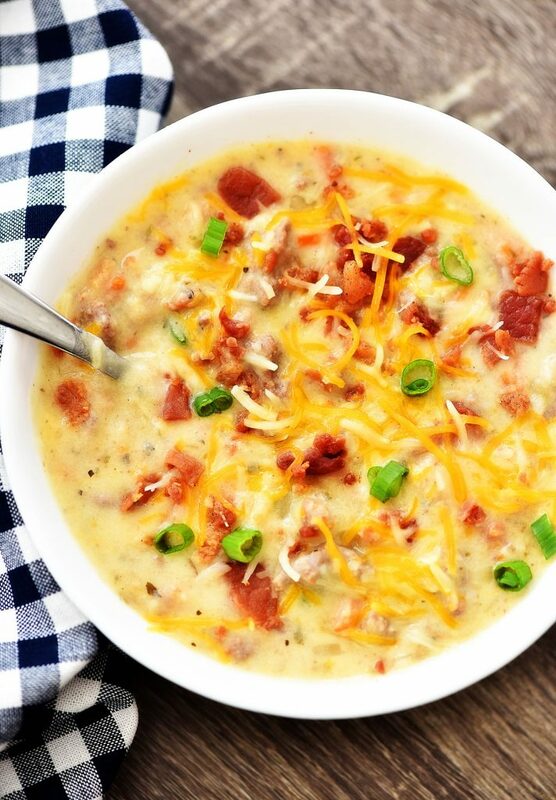 How can I make this bacon cheeseburger soup gluten-free? First step is to grease the insert of your slow cooker. (I personally use a 7 quart size slow cooker.) Add the veggies to slow cooker then pour the chicken broth over the top. Cover with lid and let cook at your desired time. This recipe gives you the option of cooking it on low heat for a longer period of time, or on high heat for a shorter amount of time. When you have about an hour left of cooking time, cook the ground beef and bacon, then add them in to the soup along with the remaining ingredients. Cover with lid and cook on low heat or the warm setting for another 30 minutes or until everything is heated through and cheese is melted. Serve in individual bowls with chopped green onion. Yum! 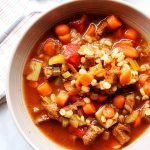 Love slow cooker soup recipes? Place potatoes, onions, carrots, dried basil and parsley in a large crock pot. Pour chicken broth over vegetables. Cover with lid. Cook on low heat 6 to 8 hours OR on high heat 4 to 5 hours or until potatoes are tender. About 45 minutes before serving, cook and crumble ground beef in a large skillet over medium-high heat. Drain any grease. Pour cooked ground beef into crock pot. Add in the cooked, chopped bacon as well. Carefully wipe out hot skillet with a paper towel then add butter. When butter is melted whisk in flour and cook until golden brown and bubbly (about 1 minute.) Whisk in the milk, salt and pepper. Pour mixture into the crock pot and stir to combine everything. 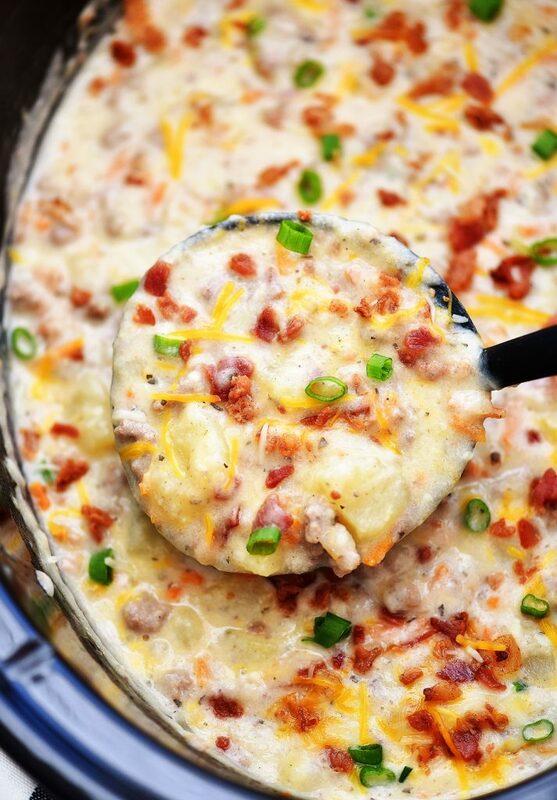 Add shredded pepper jack cheese to crock pot. Stir again. Cover with lid and cook another 20 minutes or until cheese is melted. *Cook times may vary depending on if you cook this on low heat or high heat. Holly, this looks soooo good! I can’t wait to make it. I know my boys will go crazy over it! Eating my 2nd serving right now. Definitely a winner! Made this tonight and its EXCELLENT!! 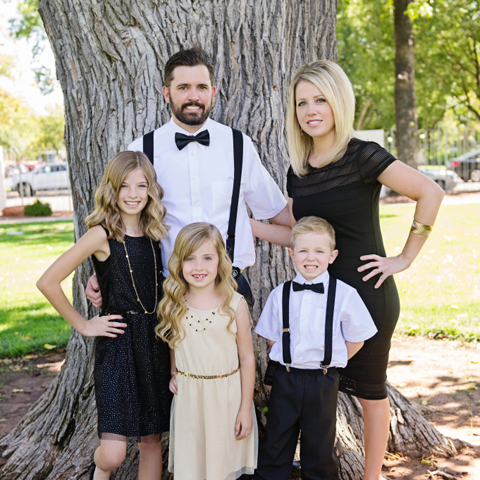 Whole fam loved it!!! !